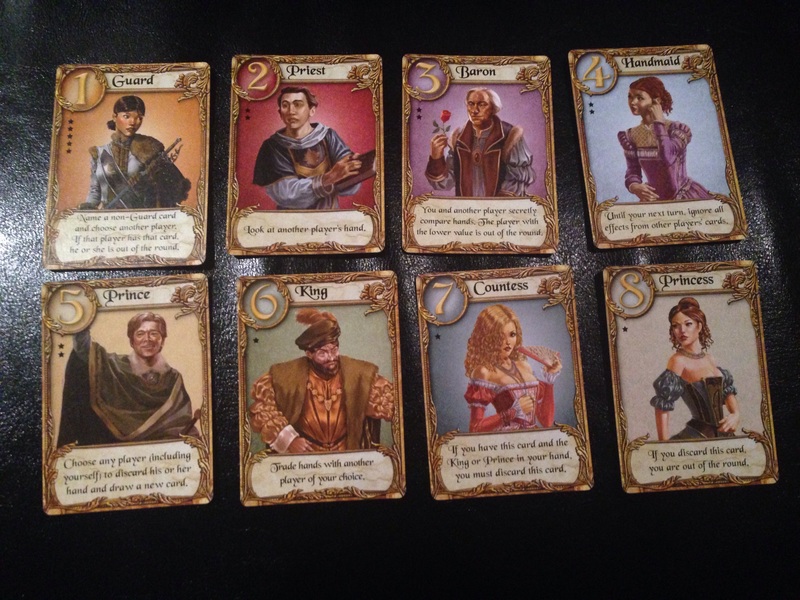 In Love Letter, players are suitors attempting to gain the princess’s affections. They do this by trying to get their love letter to her into the hands of her closest confidants to deliver to her. If you can get your love letter into the hands the confidant closest to her, the princess will read your love letter before anyone else’s and you will gain her affection. Gain her affection often enough and you win her heart and hand in marriage. The basic mechanics of Love Letter are quite simple; the dealer shuffles up the sixteen card deck, discards the top card, then deals out each player one card. On their turn a player draws a card from the deck and then must play either card in their hand and resolve its effects. These effects can be to look at another player’s hand, forcing another player to discard, swapping hands with another player, comparing hands in secret and eliminating the plawyer with the lower in-hand card, or guessing another player’s card and eliminating them if you guess correctly. When the last card of the deck is drawn and played, the players who have not been eliminated compare their in-hand cards and the player with the highest card wins a token of the princess’s affection; the first player to reach four tokens of affection wins (although number does vary with how many players you have). The base mechanics of this game are incredibly simple and I have found that once you go over those, the best way to learn how the game goes is just to dive in; players figure out what all of the cards do very quickly, plus there is a reference card for each player in case they don’t remember. After playing a few rounds the strategy and intrigue of the game start to become more obvious. It comes down to figuring out what your opponents have in their hands and what you can do to eliminate them while guarding your high cards. Love Letter is a tiny game–the deck of cards is only sixteen cards and everything you need to play comes in this nice velvet bag. It’s the kind of game that is handy to just toss into your purse or pocket and play when you’re waiting for something. It is also ridiculously inexpensive–I got it at my FLGS for about $10 (I think I’ve seen it on Amazon for even less, but you should support your local game store). For such a low cost game the components are most certainly not cheap; the cards are beautifully illustrated, the tokens of affection are wooden, and the bag everything comes feels like good quality velvet. I really enjoy this game, it’s quick and easy to learn and play, but it manages to have a nice level of strategy above what the simple mechanics initially indicate. There is a certain amount of randomness and there will be certain hands that there is really no way for you to win, but each hand goes very quickly. The theme of the game doesn’t seem overly integral to the mechanics of the game, but they do add some nice flavor and lead to my friends shouting “Chastity belt!” anytime they played a Handmaiden card. AEG has also produced several versions of Love Letter with various settings (I played one themed on the game Legend of the Five Rings and I have seen a Hobbit version), but they all seem to be the same game just with different names for the cards. 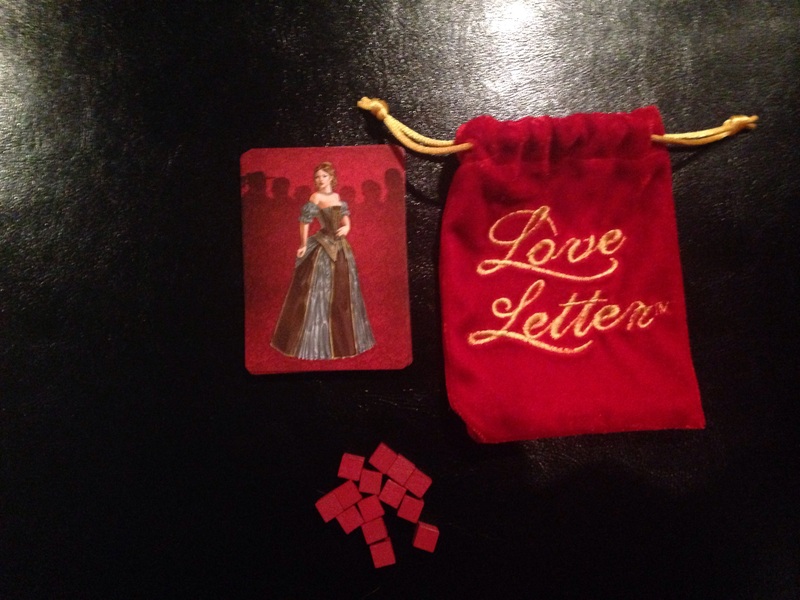 Love Letter is designed for 2 to 4 players. I haven’t had a chance to play it with just two players yet, but it worked out well and strategy and gameplay didn’t change too much with three, four, and even five players. I would like to try combining two decks and playing it with 6 to 8 players, it seems like it would work out decently. This game is definitely light fare as far as games go, but definitely a good game to start or end your game night or to ease non-gamer friends into the world of good board games. I give Love Letter 4 out of 5 stars. I got Love Letter during the snowy months last year to help past the time. Little did I know that it would be the hit that it is!